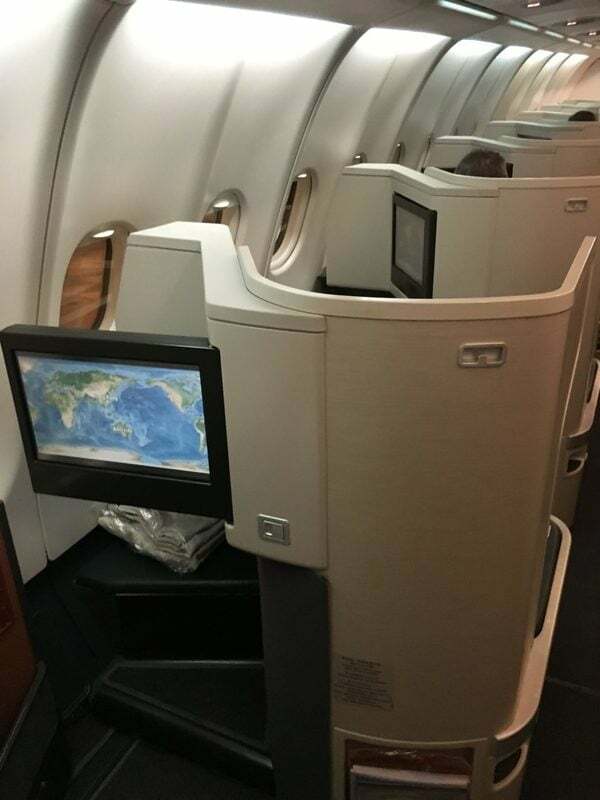 A review of Cathay Pacific Business Class from Adelaide to Hong Kong, flying the A330-300. This award winning business class product is available from many Australian cities. Cathay Pacific business class is a solid and enjoyable product. The Cathay Pacific fleet offers an incredibly comfortable fully flat bed in their award winning business class. Conveniently, they services a network of major Australian cities including Sydney, Melbourne, Brisbane, Perth and Adelaide. 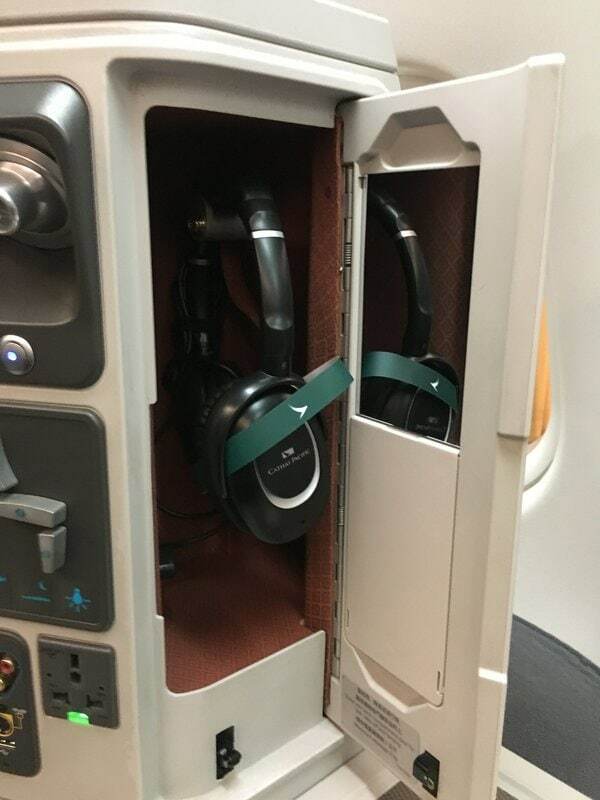 Unfortunately, Cathay Pacific first class isn’t available ex Australia, but I hope to fly it soon. With award seats easily bookable using Qantas Frequent Flyer points, Cathay Pacific business class is a very accessible product for Australian travellers. Recently, I had the opportunity to fly from Adelaide to Hong Kong before taking an Emirates First Class journey to Europe. You can read more about how routing award flights via Hong Kong could save you hundreds of dollars in this post. Cathay Pacific Business Class award space is relatively easy to come by using Qantas Frequent Flyer points. Flights are also reasonably priced when redeemed via Cathay’s frequent flyer scheme, Asia Miles. I booked my one way award flight for 45,000 Asia Miles which I’d transferred across from my American Express Explorer Card. As an international business class passenger, I had use of the domestic Qantas Club, the only OneWorld lounge at Adelaide Airport. My flight was due to depart at 6.25 am, and I arrived just before 5 am (the time the domestic Qantas Club opens). Staff completed my check-in quickly, and within five minutes, I was on my way to the Qantas Club. The Adelaide Qantas Club is fairly unremarkable, but it’s a pleasant enough space to relax in for awhile. I ordered a latte and thumbed through the papers whilst I waited for the boarding call. I set off to the gate as soon as the flight was called, as I still needed to clear international security prior to boarding. The security clearance didn’t take long and boarding commenced shortly thereafter. 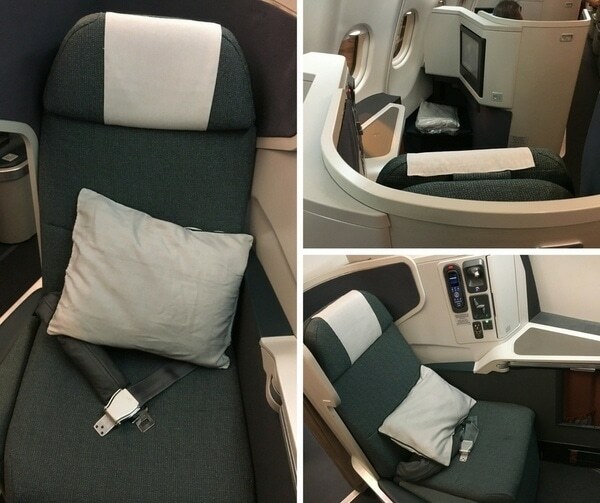 The Cathay Pacific business class A330 cabin features 39 seats in a reverse herringbone configuration. The 1-2-1 layout provides aisle access for all passengers. This avoids disturbances by other passengers getting in and out of their seats. The window seats in the business cabin are relatively private and popular with solo travellers. Those travelling in pairs might choose to reserve the two middle seats. These seats feature a retractable divider, allowing for interaction during the flight. Upon boarding, I was promptly shown to my seat, 15A. I’d chosen this seat as it is located in the middle of the cabin, away from both the noise of the galley and far away from the toilets. The seat features a large bank of windows which helps the space to feel light and airy. 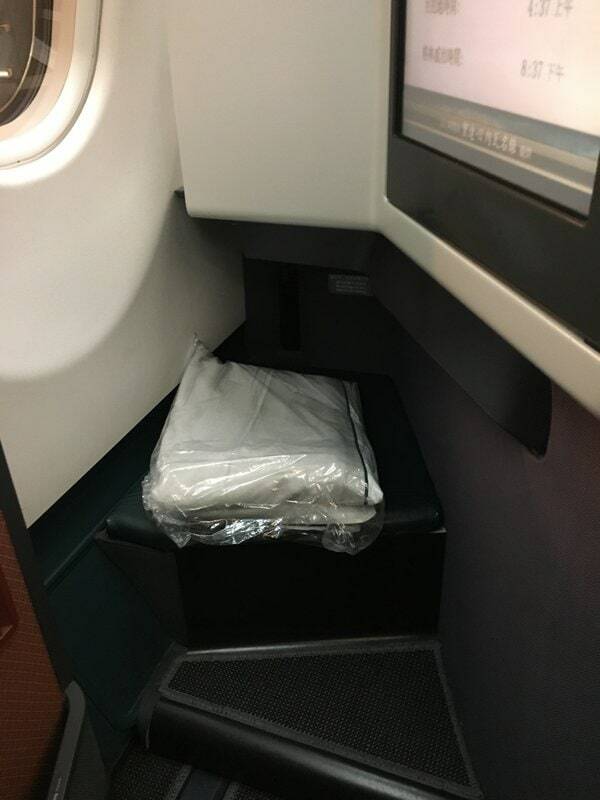 The Cathay Pacific business class seat features lots of handy areas for storage. These include side compartments and a footwell. 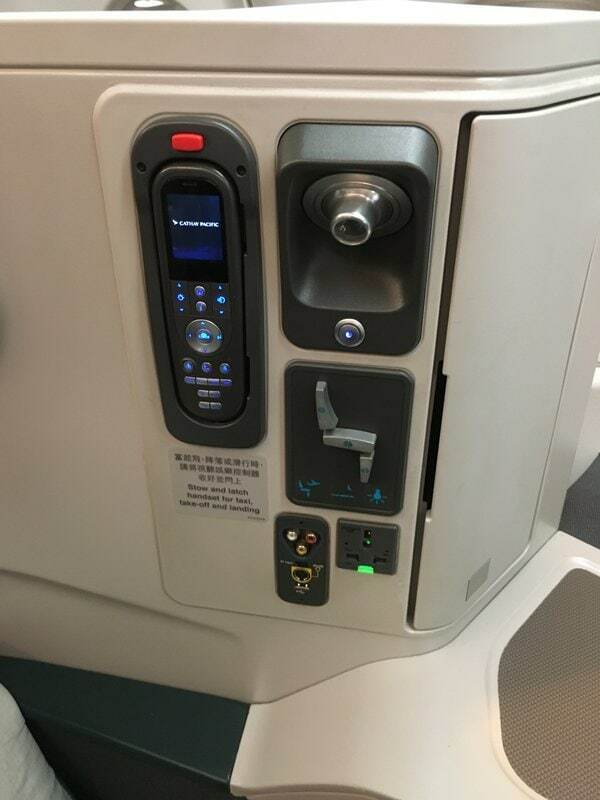 A bank of controls is located to the left of the seat, featuring the entertainment system handset, airflow and seat recline controls and input jacks. A handy little storage cupboard to the side of the control bank contains headphones and a small vanity mirror. 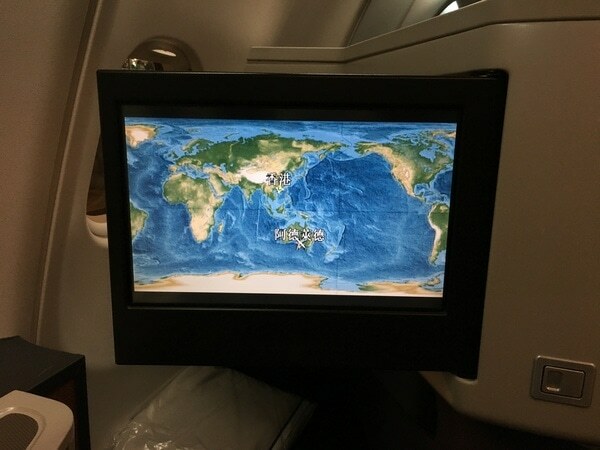 The individual entertainment screen pops out and needs to be stowed for take-off and landing. Shortly before takeoff, the cabin crew came around to offer a drink (surprisingly, the options were water or orange juice only) and to hand out amenity kits. 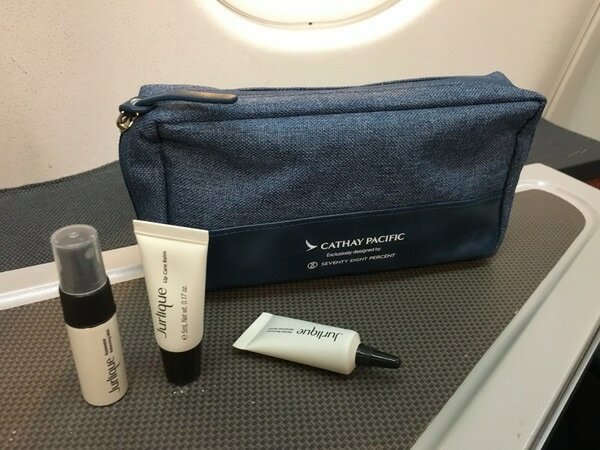 Cathay Pacific Business Class amenity kits are of a good quality and they feature products you’ll actually want to use. Seventy Eight Percent manufactures the kits and they’re stocked by natural skincare line, Jurlique, which has its origins in the Adelaide Hills. My amenity kit contained a Jurlique lip care balm, Jurlique mini revitalising mist and Jurlique mini herbal recovery serum. In addition, a set of earplugs, eye mask and toothbrush were provided. Following takeoff, the cabin crew came around to distribute menus and to take drink and breakfast orders. 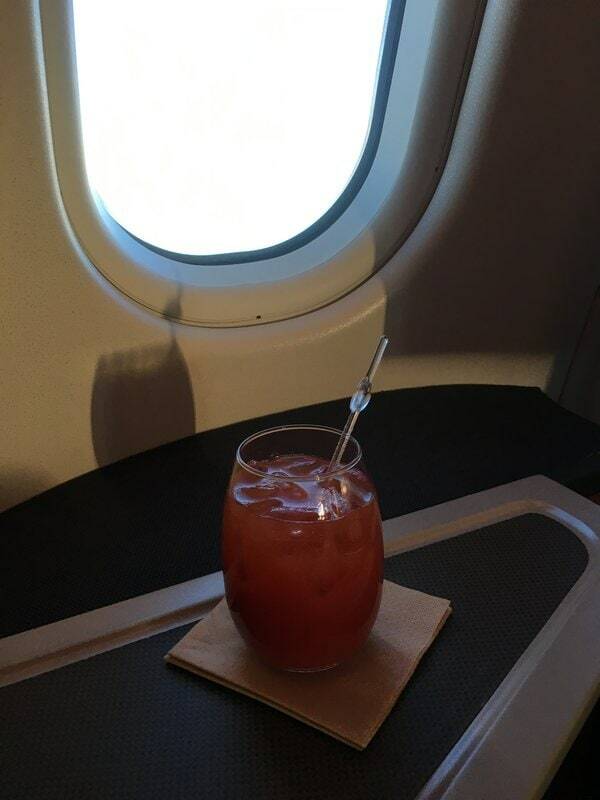 I was celebrating the start of my trip, so decided a Bloody Mary was in order. It arrived promptly, but without any garnishes. 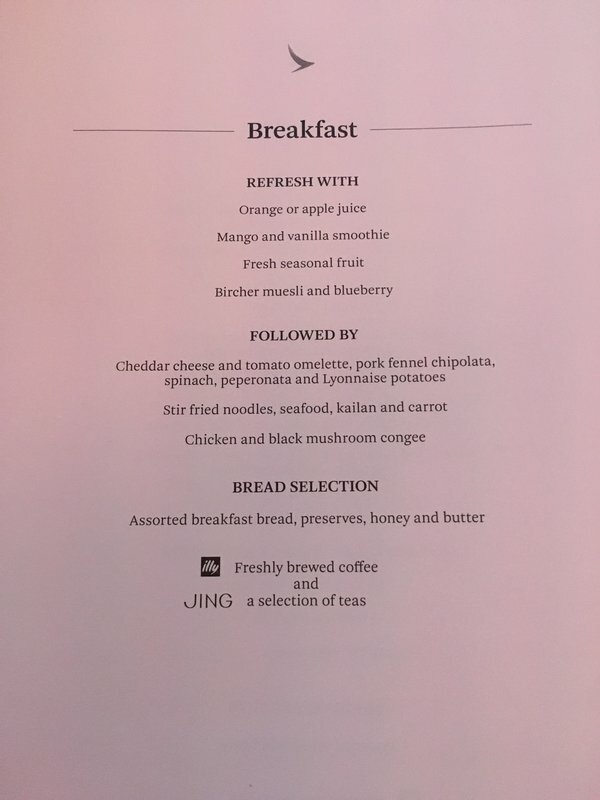 The business class breakfast menu featured a bircher muesli and fresh fruit salad, followed by the choice of a hot course. The bircher muesli and fruit salad were served first. 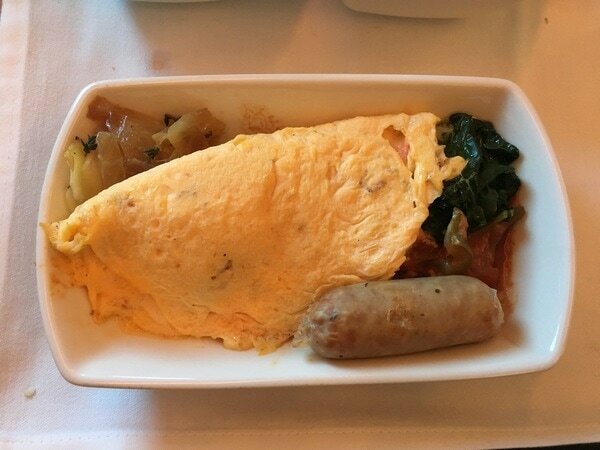 For the main course, I chose the cheddar cheese and tomato omelette. Sadly my choice wasn’t particularly tasty or well presented. 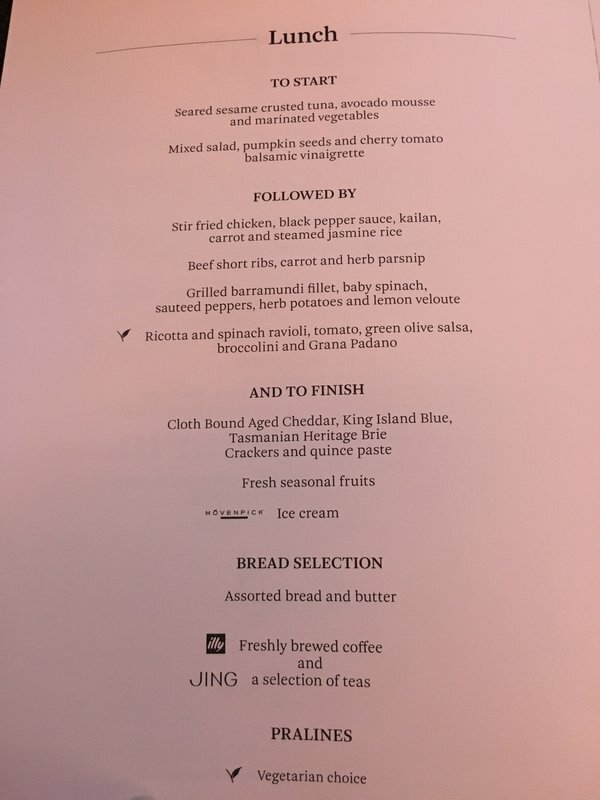 Unlike other airlines, it’s my understanding that Cathay Pacific doesn’t usually have its crew plate-up food in the business class cabin. 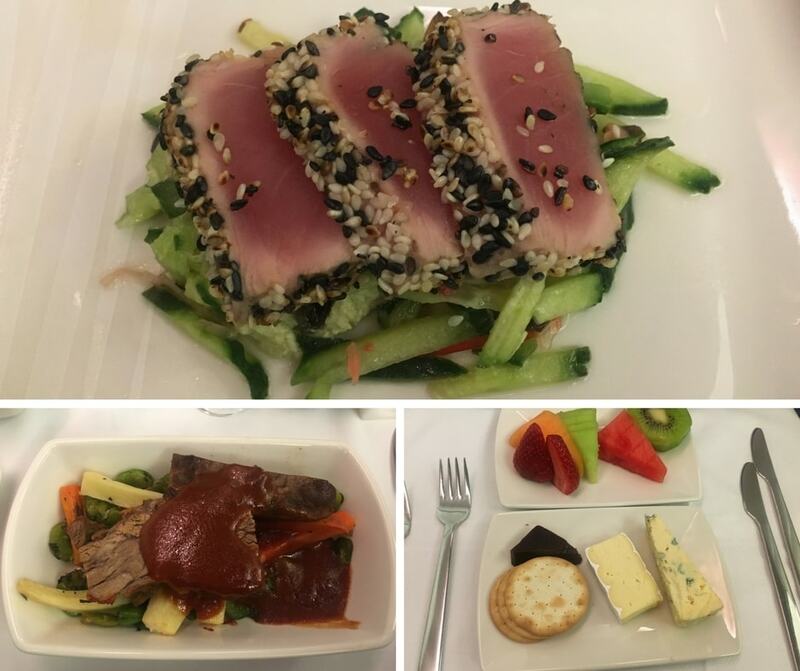 The lack of time spent plating shows in the poor presentation of the food, with even Qantas and Virgin Australia domestic business class providing a better standard. Around five hours into the flight, the crew came around to offer lunch. On offer was a seafood starter and salad for all, followed by a choice of main course, cheese or ice cream. 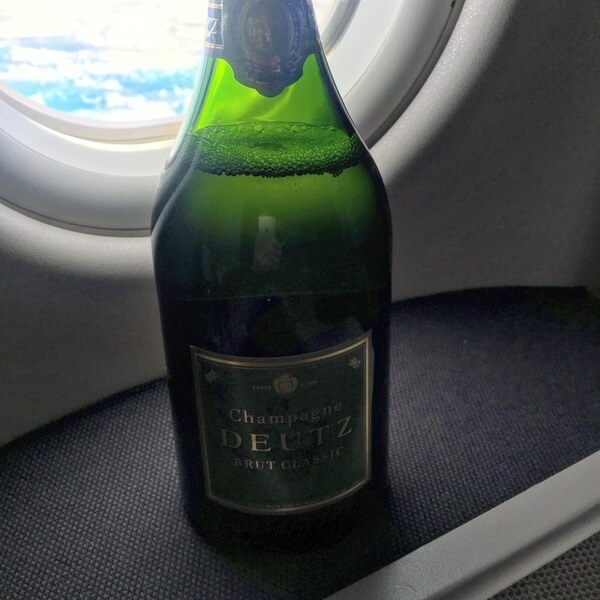 I decided to commence my lunch meal service with a glass of Deutz Champagne, which was served with a hot towel. The champagne paired perfectly with the seared tuna starter, which was tasty and well presented. For my main course, I chose the beef short rib, and for dessert, I opted for the cheese plate. 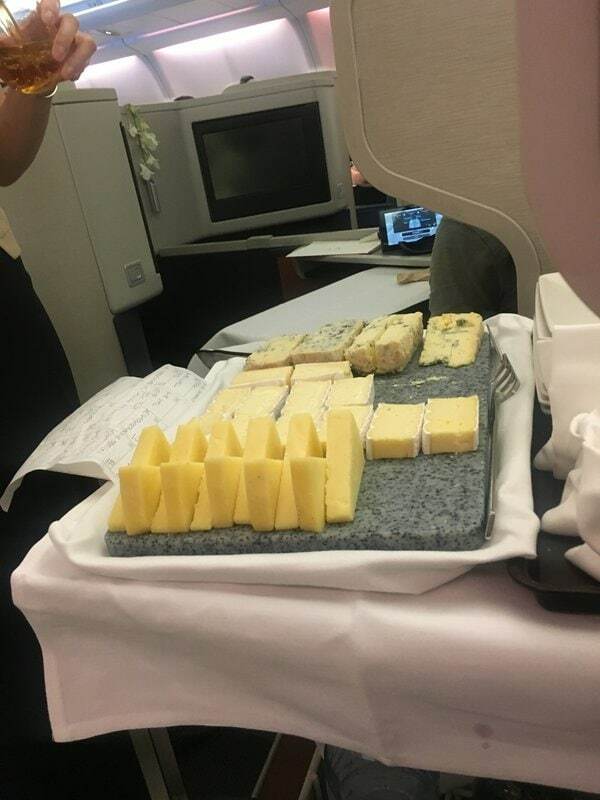 Cathay Pacific business class passengers can enjoy cheese direct from a trolley, which is a nice touch. The cheese course was followed by the offer of a signature Cathay Pacific praline (Cathay’s pralines are manufactured by the Peninsula Hotel), and a soothing Jing jasmine tea. Before long, we were just 45 minutes out of Hong Kong, and the captain announced our descent. It was a clear day, and I enjoyed the dramatic scenery of Hong Kong as we descended. We touched down just after 1pm. Cathay Pacific Business Class is a highly rated product amongst many bloggers and travellers, and for good reason. Overall, I enjoyed my flight, and look forward to travelling this product again soon, when I visit Sabah. Cathay offers a consistent and reliable hard product, and we’re lucky that it’s very accessible from Australia. The hard product is very comfortable, and entertainment options are fantastic. 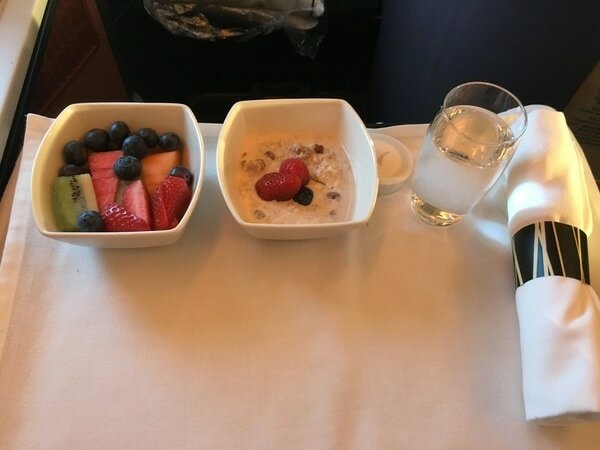 Having said that, I feel that the quality and presentation of food served in the business class cabin is inferior to other airlines. This area warrants some improvement.